This Saturday, join us for standup clean comedy! 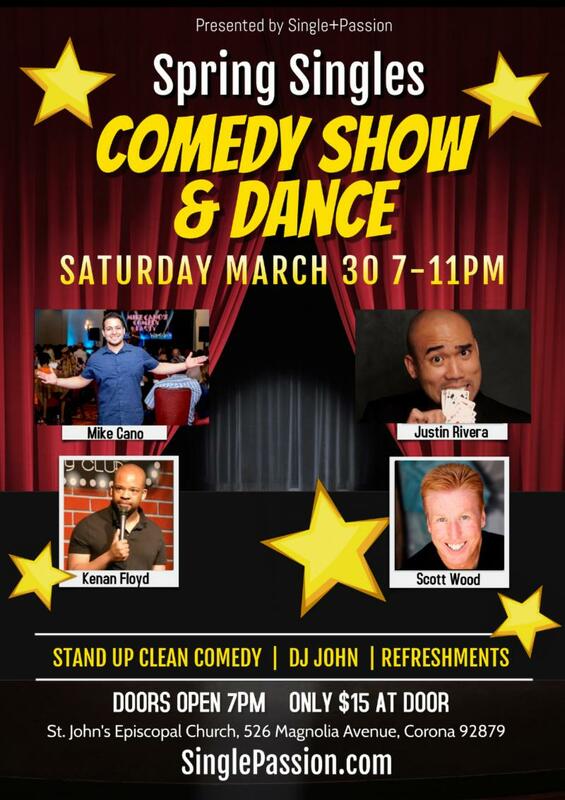 Don't miss our annual Spring Singles ☀ CLEAN COMEDY SHOW & DANCE ☀ this Saturday, March 30, 7-11PM for fun and laughter. Doors open at 7PM. ☀ 4 HILARIOUS COMEDIANS ☀ with host Mike Cano, magician Justin Rivera, Scott Wood and Kenan Floyd. Justin Rivera is a headliner and nationally recognized professional magician and comedian, seen on Comedy Central, NBC's America's Got Talent (Judge's Favorite), and the World Famous Magic Castle, to name a few. After the show, enjoy dancing with DJ JOHN playing a variety of dance music. No dance experience needed. Invite a friend that needs a laugh and come have a great time. Delicious desserts and beverages included. We rent the fellowship hall. Free parking. Entrance on Magnolia Ave (cross on the corner). On the corner of Ontario and Magnolia Aves. Off the 91 and 15 freeways. Don't miss inviting your friends to join you. If you've never joined us before, now is the time to meet other friendly singles.